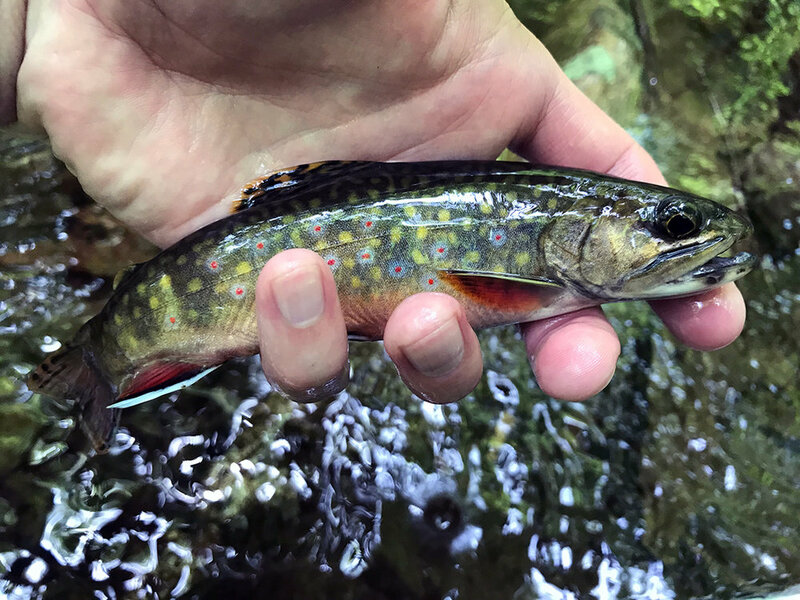 Last weekend I spent time chasing wild brook trout in the mountains of Clinton County, focusing on tributaries of the West Branch of the Susquehanna River. This weekend, I decided to move further east and search for wild brook trout in Sullivan and Wyoming Counties. There is a popular State Park located in Columbia, Luzerne, and Sullivan counties called Ricketts Glen. This park is well known in Pennsylvania, New Jersey, and New York because of its many hiking trails and magnificent waterfalls formed by Kitchen Creek. Just north of Rickets Glen State Park is a large track of state owned property known as State Game Lands Number 57. This track of game lands is made up of over 45,000 acres and has several streams running through it that hold populations of wild brook trout. The challenge I found is getting access to them. On Saturday morning I drove north to Wyoming County and attempted to enter Game Lands 57 from the north. Google Maps makes it easy to find entrances and state roads that head into the forest, what they don’t show is where roads are gated. I drove a few miles into the forest on 4x4 roads and had no issues. About a mile down this road, I ran into a State Game Commission Truck with two officers that were patrolling for spring turkey season. I chatted with them briefly and they explained that the road I was on would only be open for a few more days and would be gated after turkey season ended. I asked them about the streams I was looking to access, specifically South Brook and Opossum Creek. They said that both of these creeks were a long way back and would only be accessible on foot or by bicycle due to a second gated road. I was frustrated. I continued down the road and sure enough, where I wanted to turned left was a shut and locked gate. One truck sat at the small lot in front of the gate, probably a bird watcher, or perhaps someone even crazier than me, wiling to hiking a couple miles on foot to get entrance to a small stream. When you’re deep in the forest, cell phone signals are usually non-existent. I had no way to search for a back up entrance to access these streams. I drove all the way back the way I came. I drove out of the park and headed towards Forkston, Pennsylvania, hoping to find at least two bars on my cellphone. Eventually I hit a “live” spot and pulled into a small gas station to set my next course of action. I found that there was an additional entrance to the state land to the west, but it would require an additional thirty minutes of drive time. Did I really have a choice? I headed west. Once I reached the second entrance I followed my GPS to the first left turn that was to take me to the lower reaches of Opossum Creek. Unfortunately I found that this road was also gated and locked. It was turning into one of those days. I looked at my GPS and the map showed the road I was on continuing for another couple of miles and I saw there was an unnamed body of water crossing it. I decided it couldn’t hurt to check it out. As I drove towards this stream, I passed a small stream that paralleled the road for a bit. This water had a bronze tint and appeared to tannic. Water that is tannic is often that color due to decaying vegetation and can also be a sign of acid mine drainage. I was concerned that any water I found might be void of life, but to my surprise, when I arrive at the small bridge crossing, this unnamed body of water appeared to hold clear spring water. I looked upstream through the trees and the water didn’t look very wide. For a second I considered leaving, but I’d come this far, it was only noontime. I rigged up my 8’-4wt G-Loomis Pro-4X with a 9’-6X leader. I put 24” of 6X tippet at the end of the leader and tied on a #16 Psycho Prince Nymph pattern that was purple, had bright flash wrap on the hook and a gold bead head. The view on the blue-line water I found, just above the bridge. I hadn’t made it 25 yards into the woods and I heard a snap. It was one of my Boa laces breaking on my Simms boots. Again, one of those days. I decided to keep on going with a loose right foot. I came across a small pool and thought I saw some fish moving in it. I cast up to the top of the pool and my indicator shot under the surface. I set the hook and brought in a beautiful wild brook trout. This was good news! I continued working my way upstream. Eventually I came across a large pool of water that lay at the bottom of a nice run. After I cast my nymph and let it drift, I saw two good brook trout attack my indicator. I decided I’d give the dry fly action a try and tied on a #14 Red Humpy pattern. On my first cast with the dry fly, a brook trout splashed and took my fly. I reeled him in and marveled at how perfect he was. My first Sullivan County native brook trout. As I continued upstream I found it difficult to keep the humpy patterns floating as I’d forgot my floatant and didn’t have a mechanism for effectively drying out the flies. I moved back to my nymph rig and caught several more brook trout as I moved up into the mountain. Eventually the stream narrowed as another stream that fed it moved off in another direction. 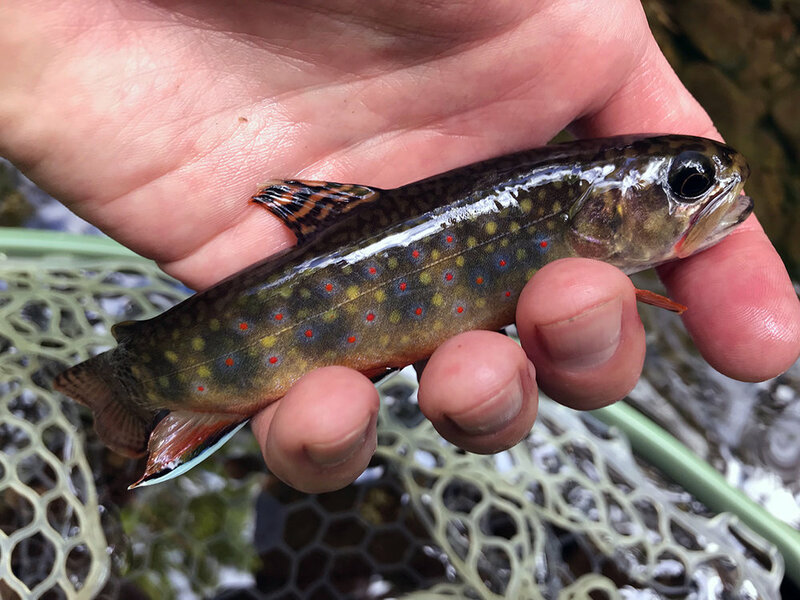 I continued to catch some very small brook trout but I decided to head back down the mountain as casting became very difficult with an 8’ fly rod. When I got back to the road, I headed downstream and started looking for deeper water that I could sneak out and around to approach from downstream. Using this approach I covered another couple of miles of water. I caught a handful of wild brook trout, all on the small Psycho Prince Nymph pattern. The mosquitoes were almost unbearable and I was kicking myself for wearing a short sleeve shirt. Eventually this unnamed body of water dumped into a large stream. This larger body of water looked like it had tea flowing through it. The tannic water looked void of life. I walked the bank for seventy-five yards and couldn’t find signs of bug or fish life. It appeared the stream I’d caught brookies in was essentially trapped in a few mile stretch of clean water. Tired of slapping mosquitoes and looking forward to a cold bottle of water, I started my trek back up through the hollow to find my truck. When I arrived, the sun was setting on a hot and muggy day. I broke down my gear, packed up my truck, drank a bottle of water, and headed back out the bumpy road that’d brought me to this blue-line stream.